Transparency Market Research (TMR) has published a new report titled, “Foot Orthotic Insoles Market - Global Industry Analysis, Size, Share, Growth, Trends, and Forecast, 2018–2026”. According to the report, the global foot orthotic insoles market was valued at US$ 3,176.4 Mn in 2017 and is projected to expand at a CAGR of 6.3% from 2018 to 2026. Rise in percentage of population requiring foot orthotic insoles to reduce foot pain and surge in adoption of technologically advanced products are anticipated to drive the global market in the next few years. North America and Europe are projected to dominate the global foot orthotic insoles market during the forecast period, primarily due to the presence of large population with diabetes, arthritis, and other painful foot conditions; rise in health and wellness awareness; high adoption of custom foot orthotic insoles, and surge in demand for preventive health care in these regions. The foot orthotic insoles market in Asia Pacific is expected to expand at a significant CAGR from 2018 to 2026. This is attributed to surge in investment in health care infrastructure, economy growth, large population base with chronic diseases and other foot pain conditions in emerging countries such as China, India, South Korea, and Malaysia; and rise in per capita health care expenditure in the region. With the progression of age, cartilages become prone to strain and fatigue due to less water content. This leads to arthritis and other complications, wherein connective tissues such as ligaments attached to the bones become less flexible and more constrained. These factors are expected to propel demand for foot orthotic insoles to ease out the pain. Lifestyle changes along with changes in eating habits lead to increase in obesity, which puts pressure on the joints in lower extremity and result in joint damage and other joint disorders. Increase in percentage of geriatric and obese populations is likely to propel the adoption rate of foot orthotic insoles during the forecast period. According to the American Association of Orthopedic Surgeons, the obese population is 20 times more likely to undergo knee replacement surgery compared to those who are not overweight. Prevalence of osteoarthritis, rheumatoid arthritis, juvenile arthritis, and other disorders is increasing primarily due to the aging population, obesity, and changes in lifestyle. The report offers a detailed segmentation of the global foot orthotic insoles market based on product type. The custom segment is poised to account for the leading share of the global market during the forecast period. Growth of the segment is attributed to significant funding from venture capitalists for these technologically advanced products and increase in usage of customer-specific products having unique geometrical shape by urban population. The prefabricated segment is projected to be driven by rise in number of incidence of fractures, accidents, bone degeneration diseases, spondylitis, scoliosis, and arthritis. In terms of material, the global foot orthotic insoles market has been segmented into thermoplastics, polyethylene foams, leather, cork, composite carbon fibers, ethyl-vinyl acetates (EVAs), gel, and others. The ethyl vinyl acetates segment is likely to account for significant share of the market by the end of the forecast period. Use of an EVA footbed in insole manufacturing is becoming increasingly popular owing to its comfort and support properties. The polyethylene foams segment is projected to account for the second leading share of the global foot orthotic insoles market by 2026. Properties of polyethylene foam such as superior cushioning, shock absorption, and additional support are likely to propel the segment during the forecast period. In terms of application, the global foot orthotic insoles market has been segmented into sports & athletics, medical, and personal comfort. The medical segment dominated the global foot orthotic insoles market in 2017 and the trend is likely to continue during the forecast period. Increase in incidence of medical disorders and surge in demand for improved quality of life among significant patient population are attributed to the continued dominance of the segment. In terms of age group, the global foot orthotic insoles market has been segmented into adults and pediatric. The adults segment dominated the global market in 2017. The segment is projected to expand at the highest CAGR during the forecast period. This is attributed to rise in prevalence of chronic diseases such as diabetes and arthritis among adults, increase in the use of high heeled sandals by adult women, surge in spending on personal comfort products, and rise in participation in sports. In terms of end-user, the online stores segment is projected to expand at the highest CAGR of 6.7% during the forecast period. Online platform allows new entrants to equally market their products and enables patient/consumers to choose and compare from a range of options available. The segment is witnessing increase in consumer preference because of technological advances which allow users to scan their foot at home. The hospitals & specialty clinics segment dominated the global foot orthotic insoles market in 2017 and is estimated to marginally gain market share by the end of 2026. Availability of technologically advanced products on this platform for the treatment of different kinds of diseases and sports and accidental injuries, and group purchasing policies of multispecialty hospitals that ensures return on investment for new market entrants make this segment lucrative during the forecast period. The foot orthotic insoles market in Asia Pacific is projected to expand at a significant CAGR of 7.6% during the forecast period. Increase in population, presence of emerging economies such as China and India, and large base of geriatric population in Japan present significant opportunities for global players in these countries. The foot orthotic insoles market in China is dominated by domestic players owing to high production of foot orthotic insoles in the country. 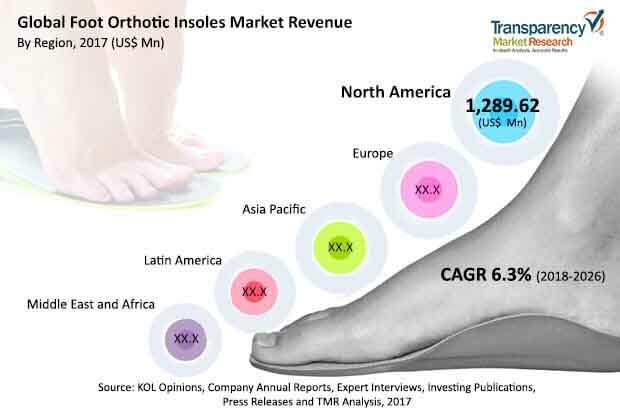 Rise in awareness about effectiveness of custom foot insoles in relieving foot pain over prefabricated ones, increase in disposable income of people, and surge in the number of orthotic and pedorthics clinics in Asia Pacific are likely to propel the market during the forecast period. North America is anticipated to dominate the global foot orthotic insoles market owing to high demand for expensive custom-made foot orthotic insoles, rise in the number of patients with diabetes, arthritis, metatarsalgia, and other painful conditions; high disposable income, and surge in adoption of personal comfort products in the region.